The ultimate vanilla custard french toast made with sweet brioche bread dipped in a homemade custard batter and cooked until golden brown. 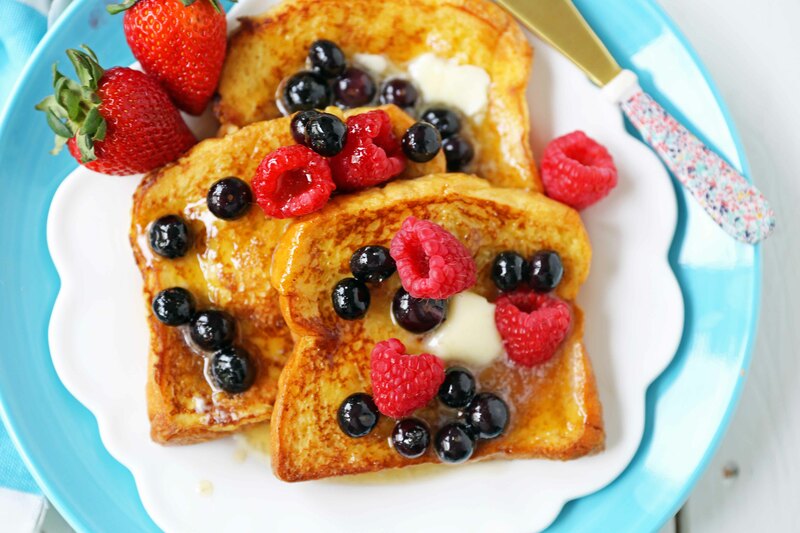 Served with fresh berries, maple syrup, and whipped cream. Everyone needs a classic French Toast recipe in their back pocket. The beauty of french toast is that once you have the vanilla custard down, you can change up the type of bread used in this french toast. I picked up some sweet brioche bread, already sliced, in the bakery section of my local grocery store. Brioche is a pastry of French origin that uses butter and eggs for a rich and tender crumb. It is thick enough to hold up to the milk and egg vanilla custard. When choosing a bread to make french toast, the bread needs to be thick and sturdy enough to withstand being dipped into a custard. If you choose a flimsy white cheap bread, it may disintegrate right before your eyes. 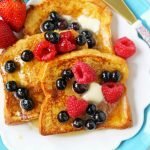 Brioche or Challah bread work beautifully in french toast because those types of bread hold up well and are full of rich flavor. 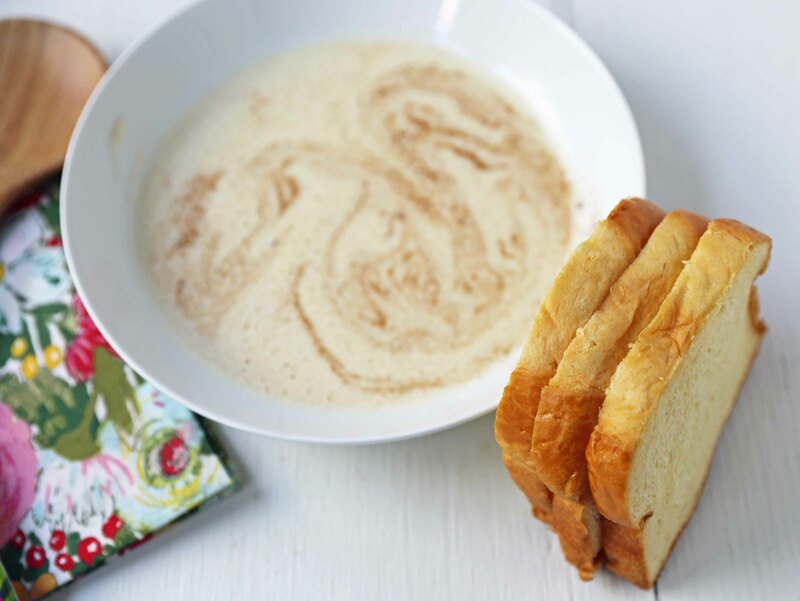 You can also use Texas Toast, Cinnamon Swirl Bread, or French Bread. French Bread creates a crusty, sturdy French Toast. If you are using French Bread, you may need to soak it for 30 seconds longer. How to make a Custard Batter for French Toast? The French Toast custard is made with eggs, half ‘n half, cream or milk, sugar, vanilla, salt, and cinnamon (optional). The key is to whip the custard well so the egg is completely incorporated into the milk. This can be done in a bowl with a whisk, a fork, or the entire mixture can be whipped in a blender. Add more sugar if you want your French Toast to be sweeter. 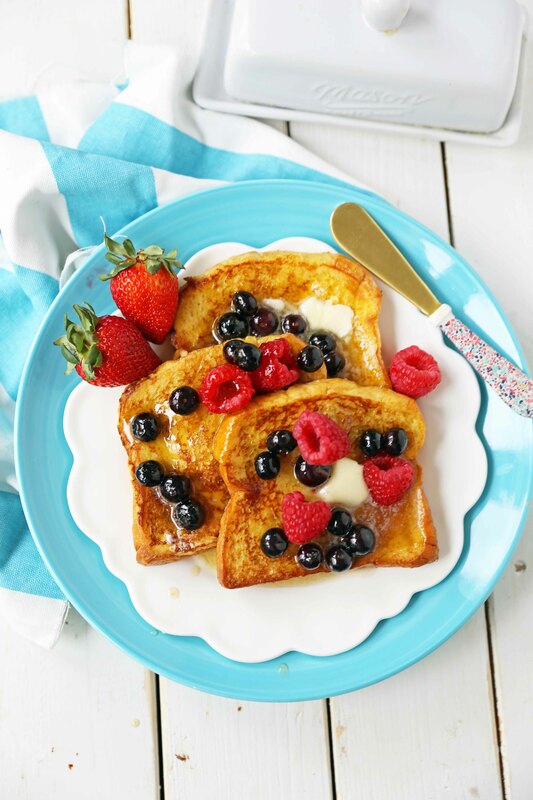 How do you make the Perfect French Toast? Start with the Perfect Bread. Brioche, Challah, Thick Texas Toast, or Cinnamon Swirl are my favorites to use in French Toast. Make a Sweet Custard Batter made with eggs, cream, sugar, vanilla, a pinch of salt, and cinnamon. Dip the bread into the custard batter for about 1 minute per side, to fully coat the bread. Heat a skillet over medium heat. Place a pat of butter and let it begin to sizzle. Add french toast slices dipped into custard into the skillet. Cook for 2-3 minutes per side. Watch carefully as you may want to LOWER the heat to medium-low if the bread is browning too quickly. You want it to be fully cooked on the inside as well so low and slow wins the race. Remove from skillet and place on a wire rack so the French Toast doesn’t become soggy. The air circulation helps keeps any steam from forming underneath the French Toast. You may also keep the French Toast warm by placing in an oven set to 200 degrees. Top with Powdered Sugar, Maple Syrup, and Fresh Fruit. If you LOVE French Toast, you can check out my Strawberries and Cream Stuffed French Toast. How to make the Perfect French Toast. 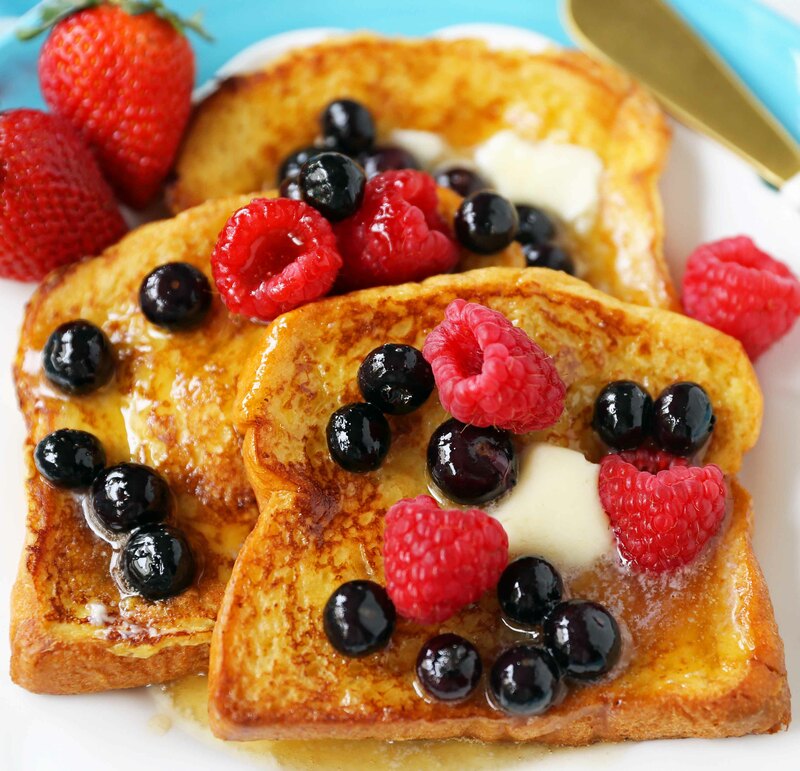 The BEST classic French Toast Recipe with tips and tricks for making perfect French Toast. In a shallow bowl or pie plate, make the sweet custard batter by whisking together eggs, half n half, sugar, vanilla, salt, and cinnamon. You may even whip it in a blender. Remove from skillet and place on a wire rack so the French Toast doesn't become soggy. The air circulation helps keeps any steam from forming underneath the French Toast. You may also keep the French Toast warm by placing in an oven set to 200 degrees. 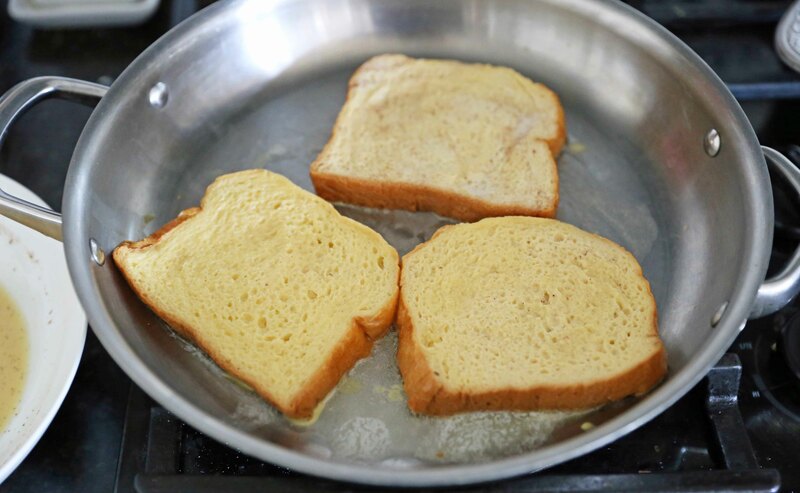 Repeat by placing another pat of butter in the skillet and continue to cook remaining bread slices. Top with Butter, Powdered Sugar, Maple Syrup, and Fresh Fruit. 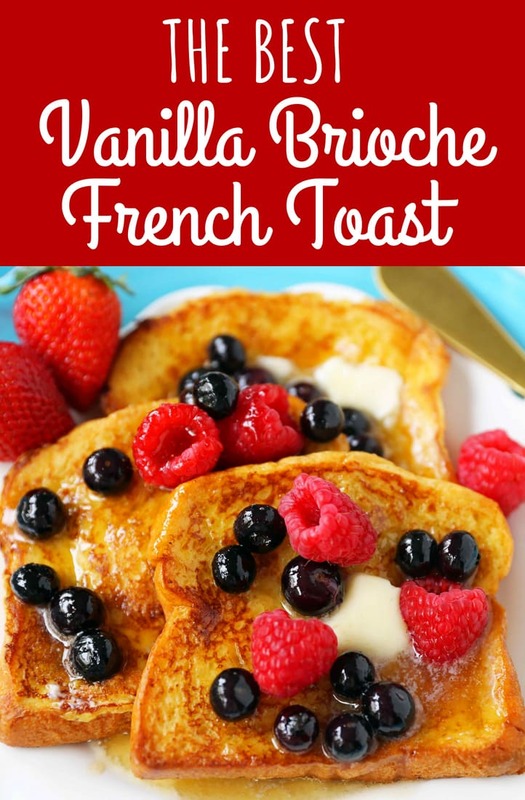 I hope you love this Vanilla French Toast with Brioche Bread Recipe. Happy Cooking, my friends!